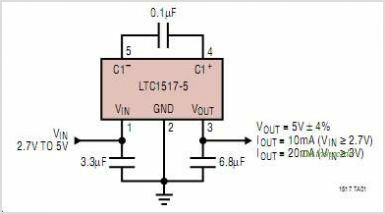 The LTC1517-5 is a micropower Charge Pump DC/DC converter that produces a regulated 5V output. The input voltage range is 2.7V to 5V. Extremely low operating current (typically 6A with no load) and low external parts count (one 0.1F flying capacitor and two small bypass capacitors at VIN and VOUT) make the part ideally suited for small, light load battery-powered applications. The total printed circuit board area of the application circuit shown below is only 0.045in. The part operates as a Burst Mode switched-capacitor voltage doubler to produce a regulated output. The part has thermal shutdown capability and CAN survive a continuous short circuit from VOUT to GND. The device is available in a 5-pin SOT-23 package. This is one package pinout of LTC1517-5,If you need more pinouts please download LTC1517-5's pdf datasheet. This is one application circuit of LTC1517-5,If you need more circuits,please download LTC1517-5's pdf datasheet.